More news has trickled out for the high-end tablet releases we are about to see. 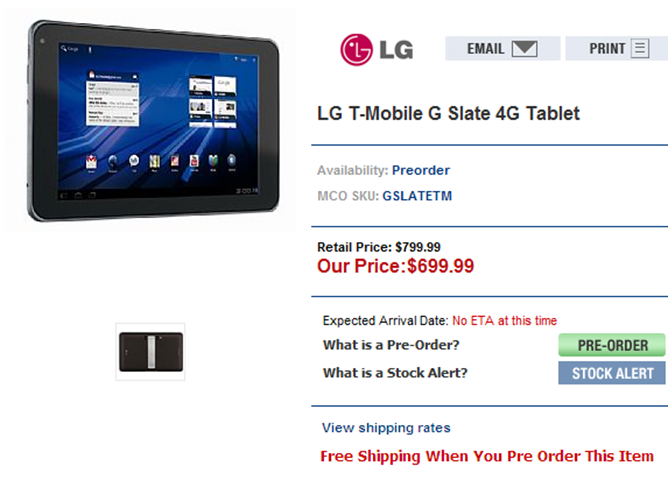 This time it appears that the upcoming Optimus Pad/G-Slate from LG will be priced at $699.99 on T-Mobile, according to a pre-order listing on Mobile City. LG's 8.9" tablet will be the first to incorporate 3D technology, and, like most other new tablets we will be seeing soon, it will have Android 3.0 'Honeycomb' under the hood. No firm release date has been set. The off-contract price for the 4G-ready tablet is in the same ballpark as the first generation iPad 3G (which obviously weighs heavily in determining costs), but if the same pattern holds as with the Motorola XOOM, we may not see a Wi-Fi-only model at release. One can't help but wonder if the manufacturers of Android tablets are shooting themselves in the foot by delaying the releases of their Wi-Fi models (presumably because of deals with carriers), but as details are still unknown with LG's debut slate, we will have to wait and see how this plays out.